Welcome to my blog and my picks for this fall festival!! Thank you, Amy for sponsoring this fabulous event once again. This is probably my most favorite quilt that I completed this year for several reasons. I was able to use up lots of my stash. 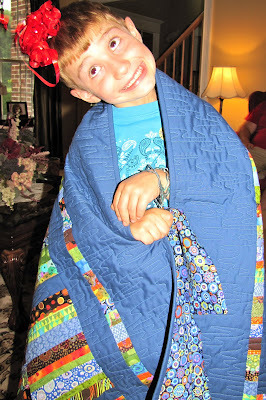 The pattern that I based this on is from Weeks Ringle and Bill Kerr of Fun Quilts. It is definitely a little more modern than traditional. This wonderful little boy's room! I created it especially for my nephew who specifically asked his mom, "When is Aunt Jackie going to make me a quilt for my bed?" He really loved it as his birthday present and I loved making it and giving it to him. This quilt had that special kind of love that goes into making a quilt. This is my second favorite of the year, but for a totally different reason. This quilt is called Pop Squares. 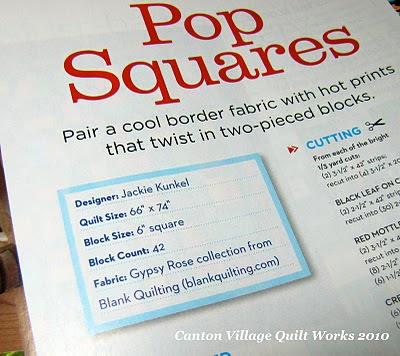 It is the first quilt that I designed, pieced, and quilted for Quick Quilts Magazine! Yes, it is my first published design. Here it is in the magazine. 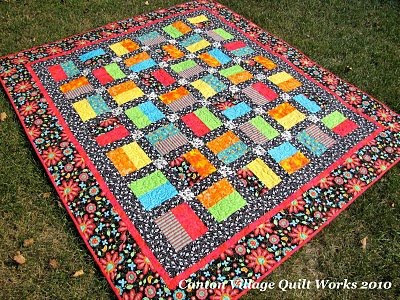 Both the magazine and the kit for the quilt can be found on my website by clicking here. I hope you enjoyed my two favorite quilts for this year!! Don't forget to back and check in for Quilt Market reports. Also, make sure you check in with Amy for all the other wonderful quilts!! Oh, one more thing... Don't forget to enter the giveaway for a fat quarter pack of silk!! Just click here.